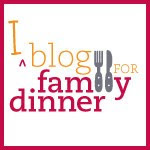 eatdinner.org: Thanks Sheryl Sandberg for Taking Family Dinner "Out of the Closet"
Thanks Sheryl Sandberg for Taking Family Dinner "Out of the Closet"
Family dinner has come up again in the news, this time thanks to Sheryl Sandberg, Facebook COO, who has come out publicly to declare that "Yes," she makes time for family dinner. It is interesting that she said she's been doing it for years, both when she was at Google and now at Facebook, but has only recently "come out" for family dinner publicly. What a powerful statement! First, that you would have to "come out" to say that you leave the office at 5:30pm so you can have family dinner (and that it is big news with over 1,000 shares on Huffington Post). And second, that one of the leading business people in America can say that finding regular time for your family is important and priceless, and that it is important for women, and men, to agree to do it. I applaud Sheryl Sandberg for coming out for family dinner. Will you? The first step to making family dinner a reality is the commitment. Talk with your family about what small steps you could take. Can you try for family dinner 2 or more nights a week? Can you build up from wherever you start? What would it take to put that together? Talking to your boss, doing more meal planning, reducing out some after school or evening commitments? Make the commitment and follow through. Just like you do at work everyday.